“A resort of many cultures, an eclectic mix of heritage chic”, thus goes the most apt tag line for Temple Tree at Bon Ton, Langkawi. 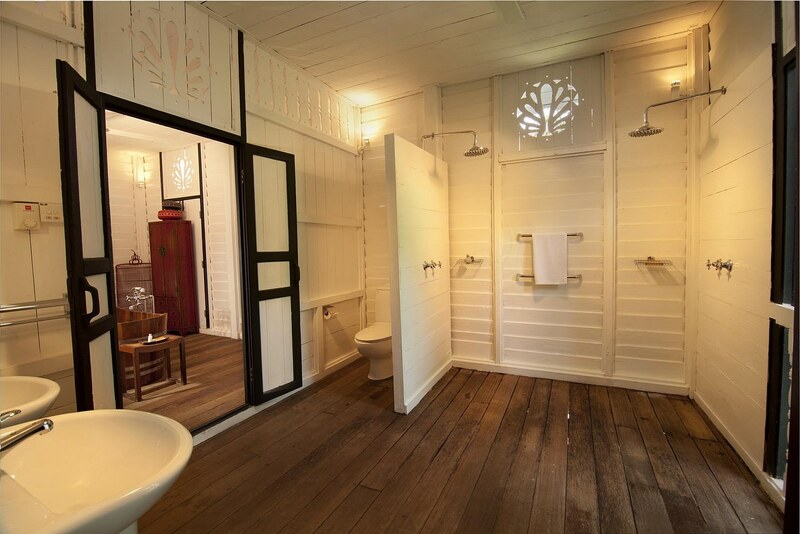 It is indeed a unique ensemble of 70- to 110-year old antique timber houses from different states of Malaysia, and of diverse cultural origins (Chinese, Malay, Indian, Arab, and even Eurasian) in eight grand villas which in turn yield 14 luxurious suites. 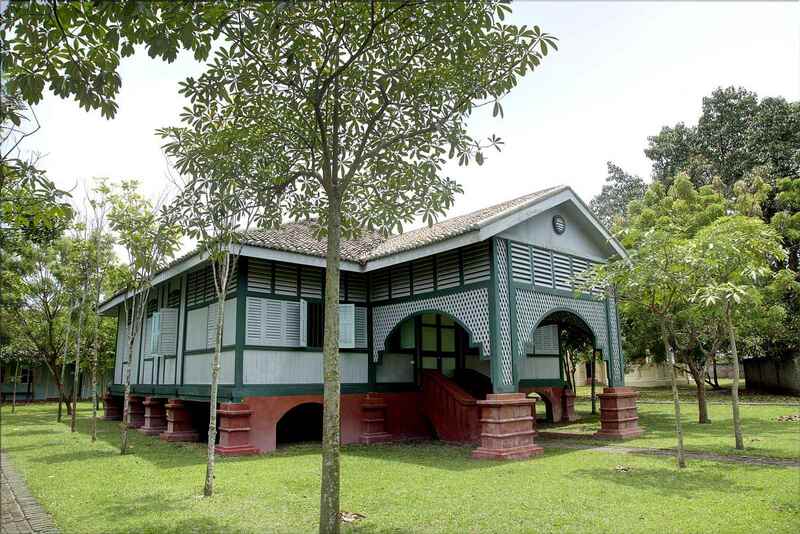 These villas are the beautiful representations of Malaysia’s architectural history, depicting designs of the different races that have enriched the Malaysian built-form heritage. Most feature a number of original aspects such as heavy hanging double doors, intricately carved timber panels and elaborate columns. The houses were photographed in their original conditions before they were dismantled. Subsequently, each piece of timber was numbered, and the houses were re-erected in Temple Tree. The whole process took the owner, Narelle McMurtrie, and her team, two-and-a-half years to complete. Three buildings are featured in this book, namely, the Pump House (not a guesthouse), plus two other abodes: the Chinese House and the Black and White House. Strategically placed at one end of a hundred-foot long swimming pool, the Pump House provides a perfectly quaint setting for the pool. 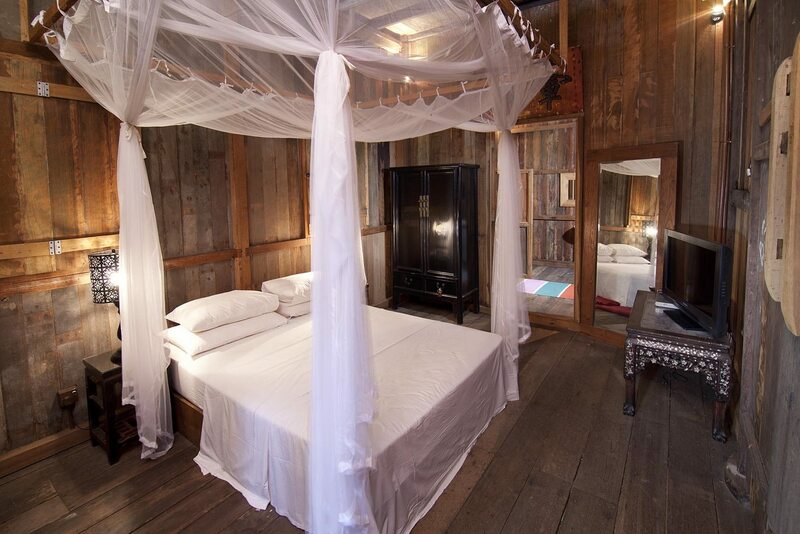 About 60% of the original timber of this house of unknown history was salvaged from another part of Langkawi and rebuilt here. 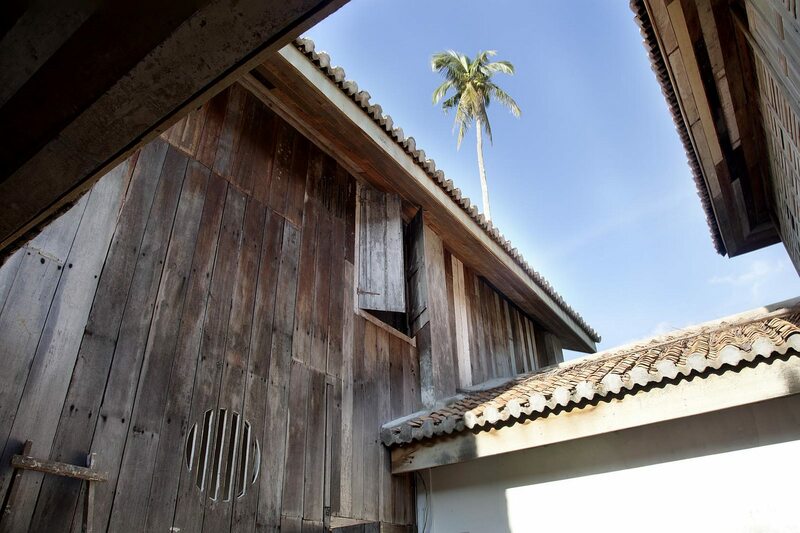 The Temple Tree’s two-storey Chinese House is approximately 100 years old and was believed to have been a farmhouse built by a Chinese family. 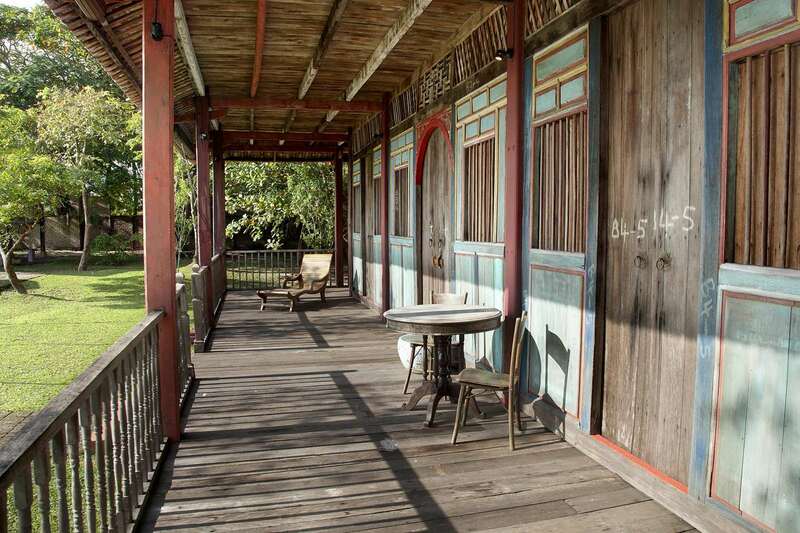 Originating from the town of Batu Pahat in the southern Malaysian state of Johor, it has generous timber-decked verandahs on three sides, on both floors. The house contains two suites: Chinese 1 on the ground floor and Chinese 2 upstairs which comes with a private mahjong room and library. The eclectic mix of red, black, turquoise, yellow and green together with the architectural style results in a stylish eccentricity that was rare in the building designs of that period. 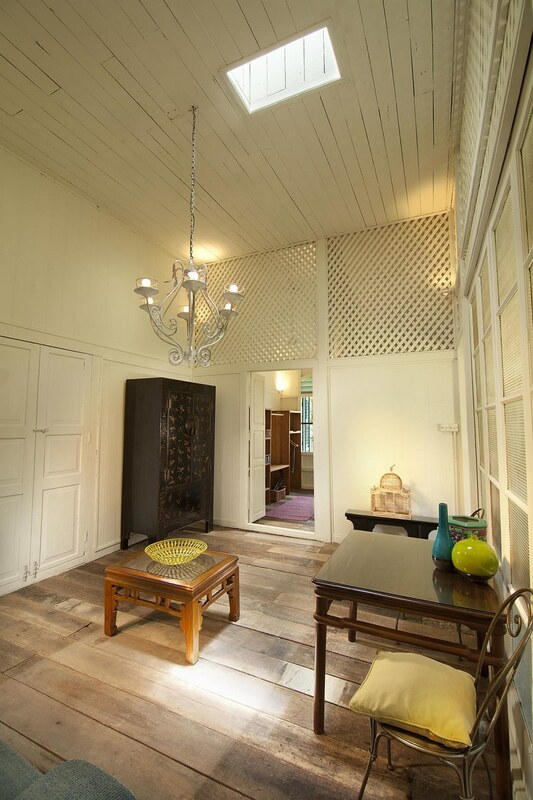 Historically, and judging from the original design of the house which includes a mahjong room and a library, it is quite likely that the house belonged to a rich Chinese family. Back in those days, only the really affluent would have the means to paint their houses, and have a dedicated room for mahjong, a traditional Chinese tile-matching game that dates back to 1890. Almost every part of the house – posts, beams, rafters, decking, balustrades, wall panels and flooring – is made of timber, mainly Chengal and Balau. 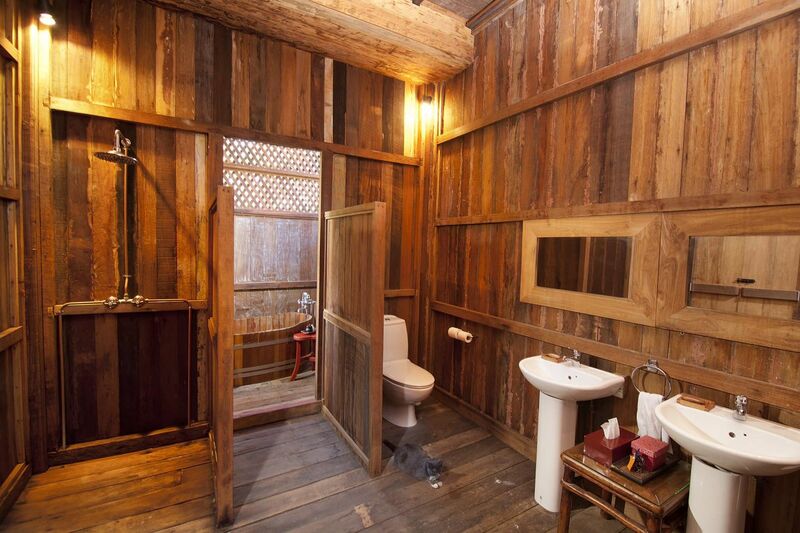 In short, timber has really stood the test of time for both form and function in the construction of this house. 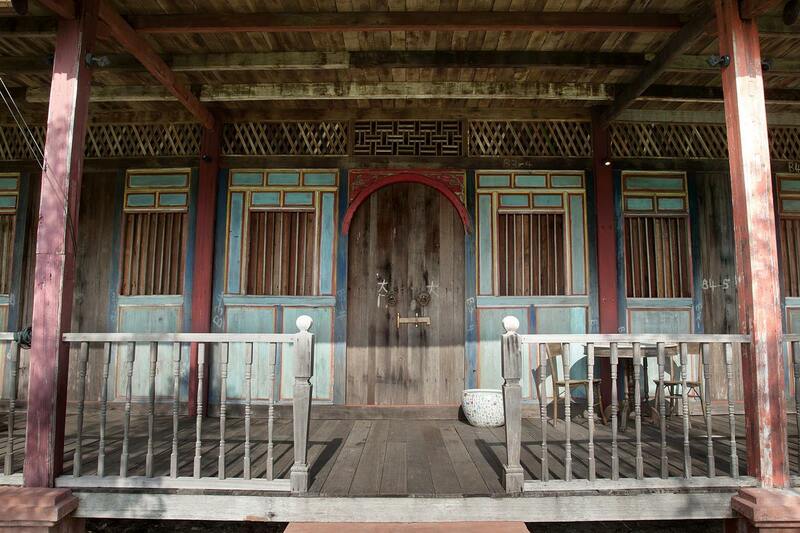 In the process of transporting the Chinese House from Batu Pahat to Langkawi, each timber piece or panel of the house was carefully recorded and numbered for ease of reassembly. Many of the numbers were deliberately left on the timber members, appearing like some secret code which adds mystic and mystery to conversations about the house. 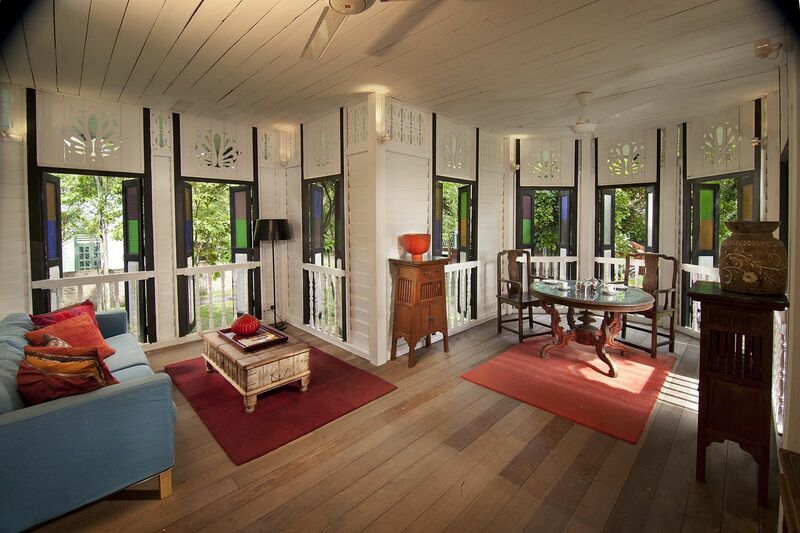 The verandahs are kept simple and austerely furnished to maintain the authentic feel of the original house. 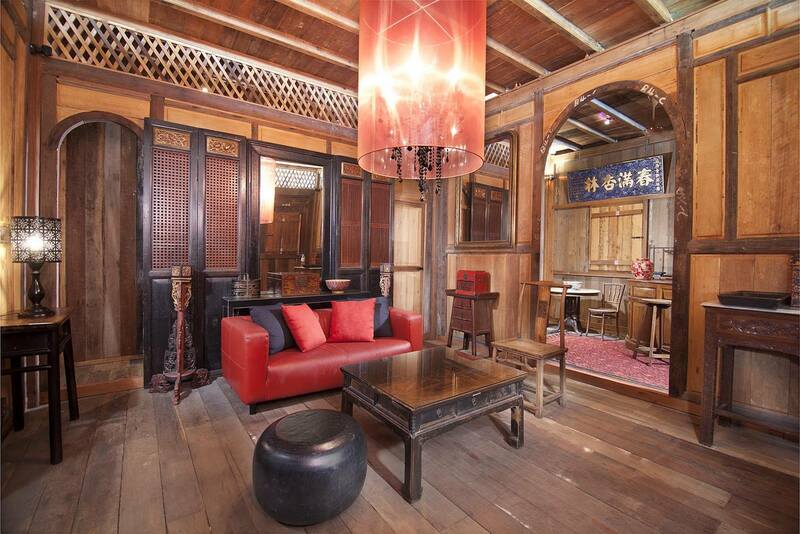 In contrast, the interior are richly furnished with touches of Chinese reds and varied collection of period pieces, some original, while others are contemporary reproductions. 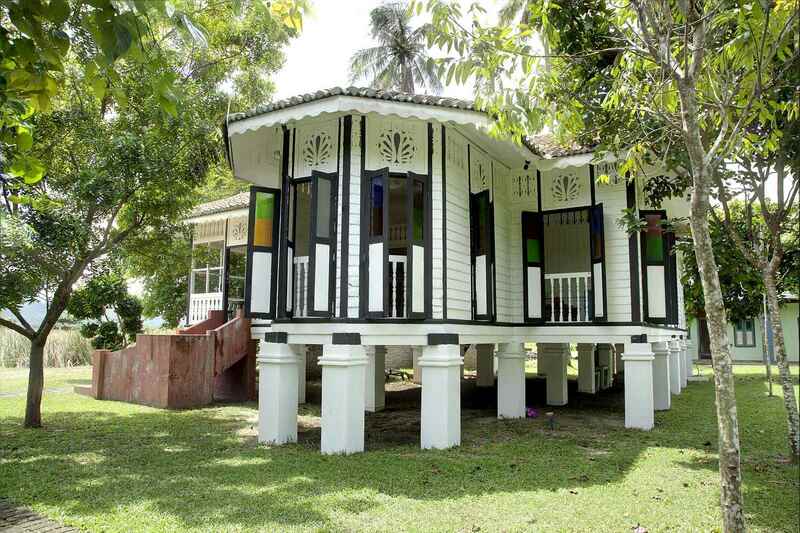 The Temple Tree’s Black and White House used to be a 1940s Malay house located in Mantin, Negri Sembilan. 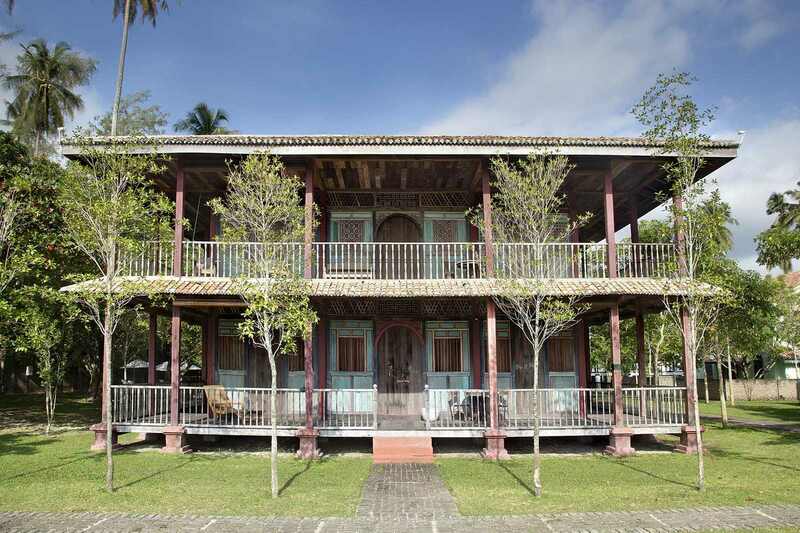 Except for the masonry piers and stairs which are new, all the timber and roof tiles of the house are original. 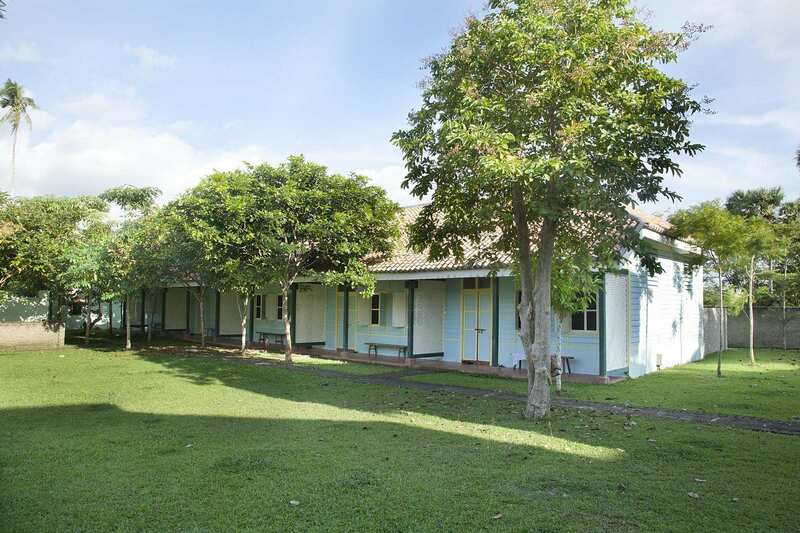 The house is self-contained with a kitchen, living and dining area, a generous outdoor porch, and a huge bedroom that comes with a wooden bathtub! 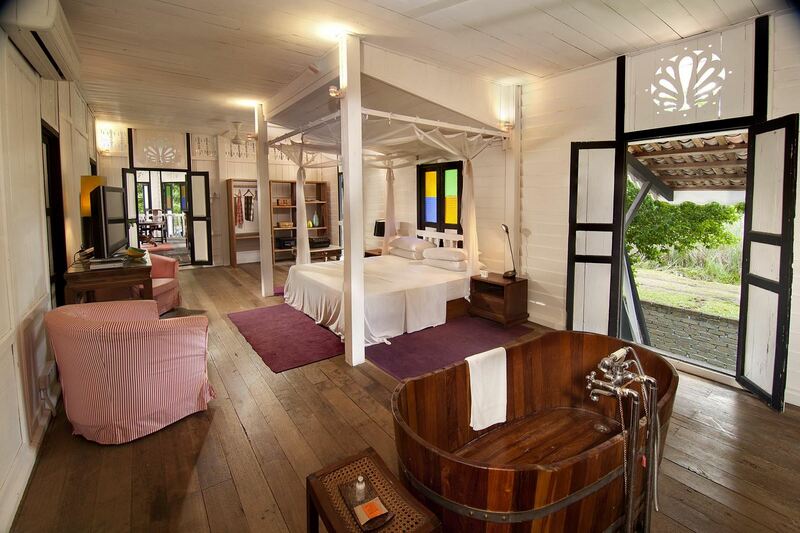 It is distinctive for its unique coloured glass window panes around the living room. 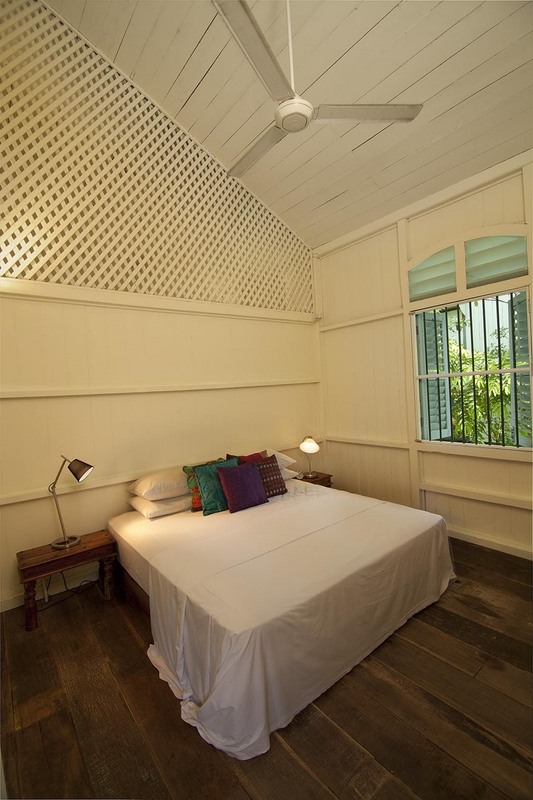 The black and white colour scheme is carried through into the interiors, reinforcing its charming personality. 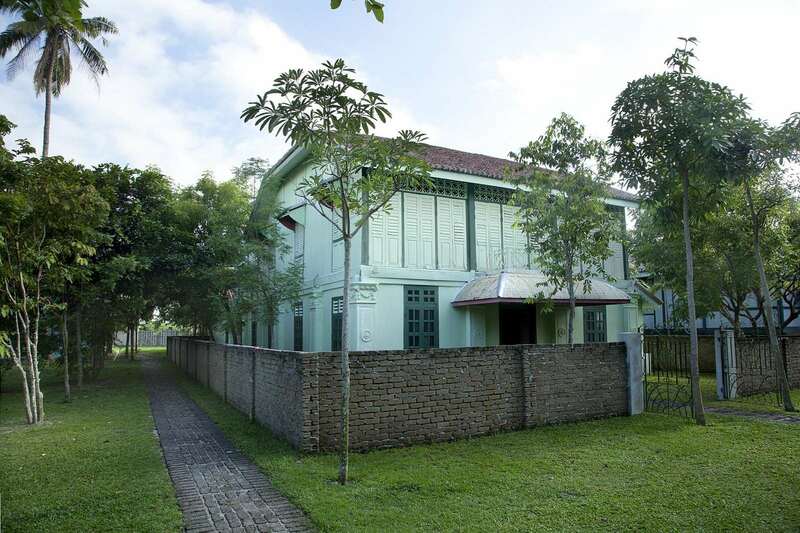 All the structural timber of these and other villas in Temple Tree are a mix of Chengal, Balau and Merbau while the interiors are mostly of Meranti. None of the houses had ever been attacked by termites, except for several pieces which were damaged by dry rot or borers. Paint and teak oil are applied to maintain the timbers. 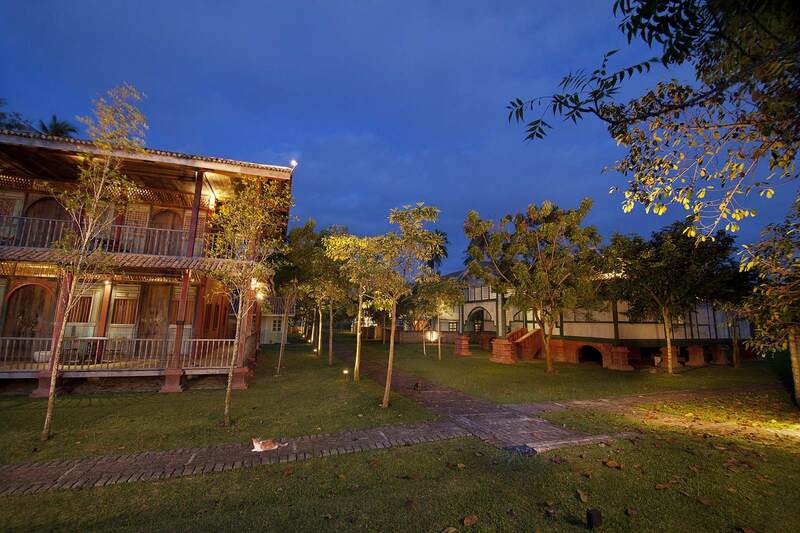 The ‘resurrection’ of old Malaysian timber buildings now collectively known as the Temple Tree resort reflects the different cultures that have made Malaysia what it is today: a melting pot of Malay, Chinese, Indian, Middle Eastern and Western influences. 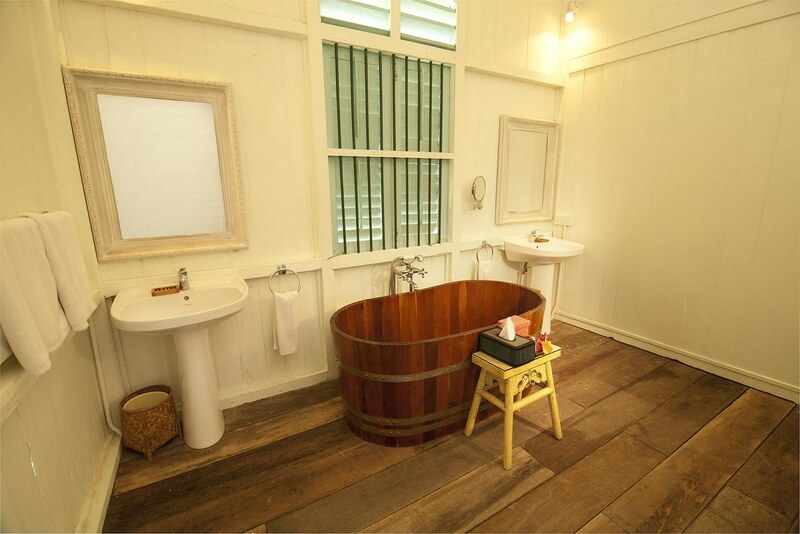 It provides guests the unique opportunity to experience these homes of different origins and eras – all made possible by the durability and agility of Malaysian timbers in their original construction.